We are a big appetizer family. It can be as informal as a bag of Tostitos and burning hot salsa, with my son stealing dollops of sour cream, or it could be as involved as pulled pork chalupas topped with guacamole. Last weekend, my girlfriend was over our house, and was generously preparing an awesome dish of shrimp in Thai coconut broth for us, so I wanted to keep the appetizer healthy too. I had an old recipe for broccoli rabe that I wanted to try because it was different from how my husband makes it, since he usually mans the rabe station. I was curious to see if it would taste any different. So I got the chance to make it when he opted to leave the two ladies in the kitchen to chat it up, and busy himself in the family room watching the Flyers lose. During intermissions, he kept visiting the kitchen to see what was coming out of it other than all the chatter. I placed the bowl of the sautéed broccoli rabe before him and cut up some provolone cheese and waited. The bowl was gone in 10 minutes. He asked me to make it again this weekend so I guess he liked it. The difference between his preparation and mine, is that I trimmed off the thicker stems and then blanched the broccoli rabe for barely 5 minutes before sautéing. He sautés and steams his in wine or beer. I like it prepared either way. His retains more of the bitterness, but I have a palate for that. The way I prepared it made it seem brighter and sweeter….unlike my personality….haha. 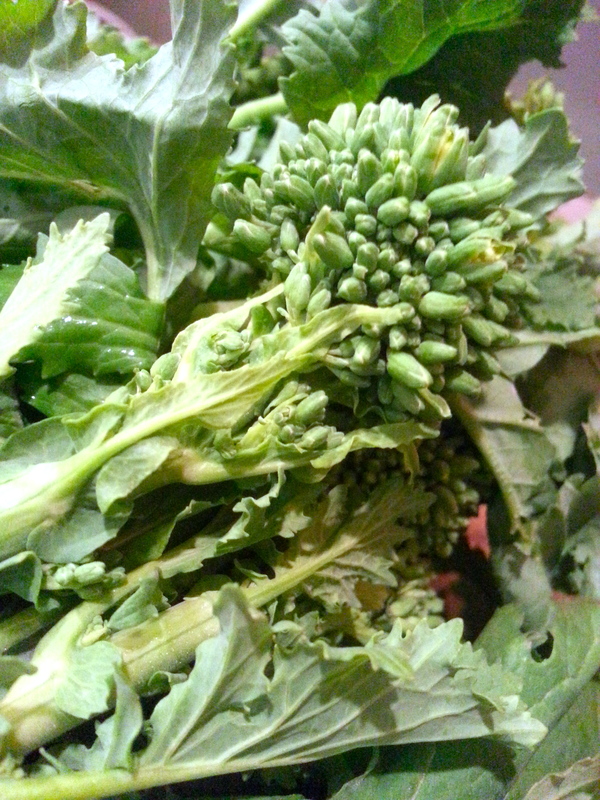 After you have trimmed and discarded any thick stems from the broccoli rabe, add the remaining broccoli rabe to a large pot of boiling, salted water. 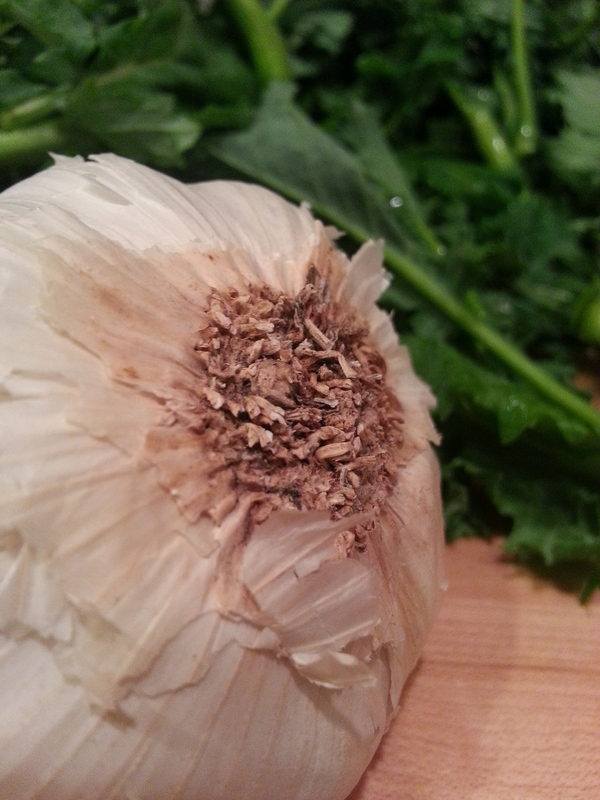 Blanch for 5 minutes until some of the thicker stems are softened. Remove and drain completely in a colander. 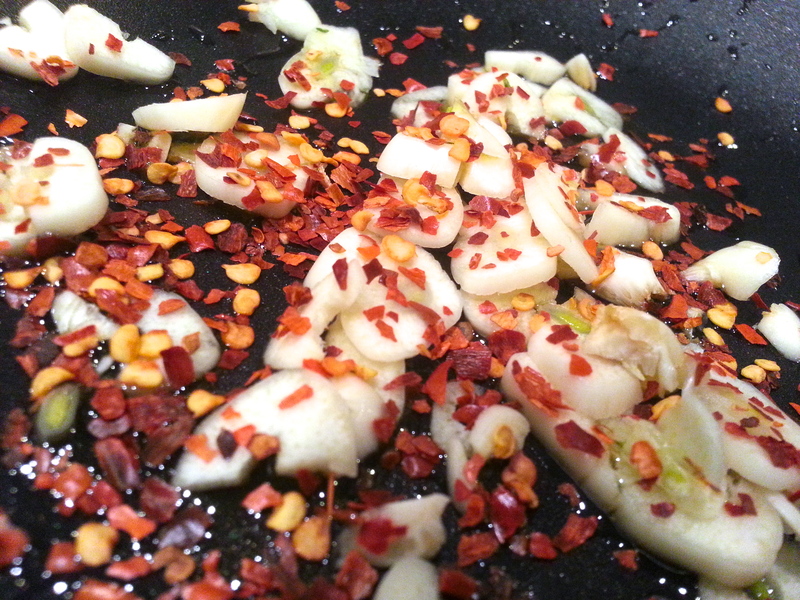 In a sauté pan, cook the garlic and crushed red pepper in oil over medium heat. Stir occasionally so that the garlic becomes golden but not burned, about 2 minutes. Add the broccoli rabe, water, and salt and pepper to the pan. Stir uncovered about 2 minutes. 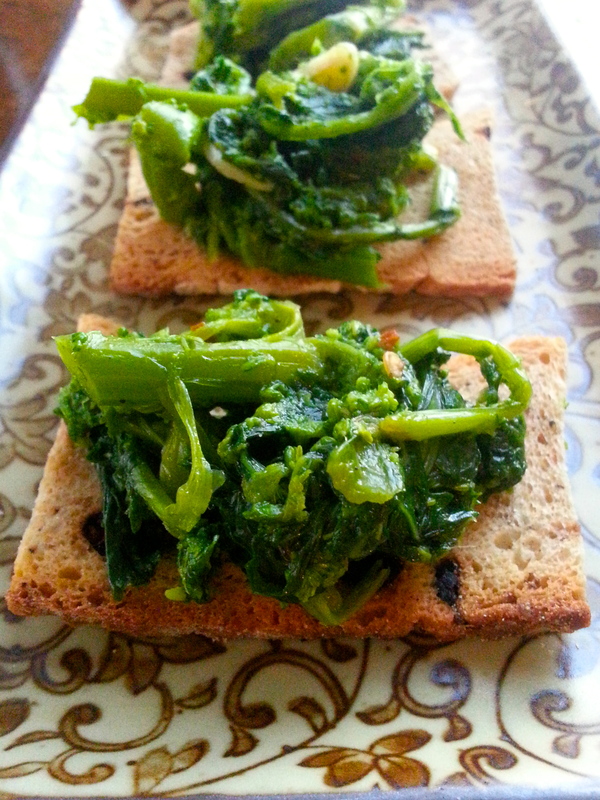 You want the broccoli rabe to remain a bright green. Serve in a bowl with a serving fork for topping crostini or crackers. note: Watch that clock when blanching…much more than five minutes and you have green mush. This also makes a great side dish for fish or pork chops. You get a good amount of appetizer servings for a group of 4 or 5. 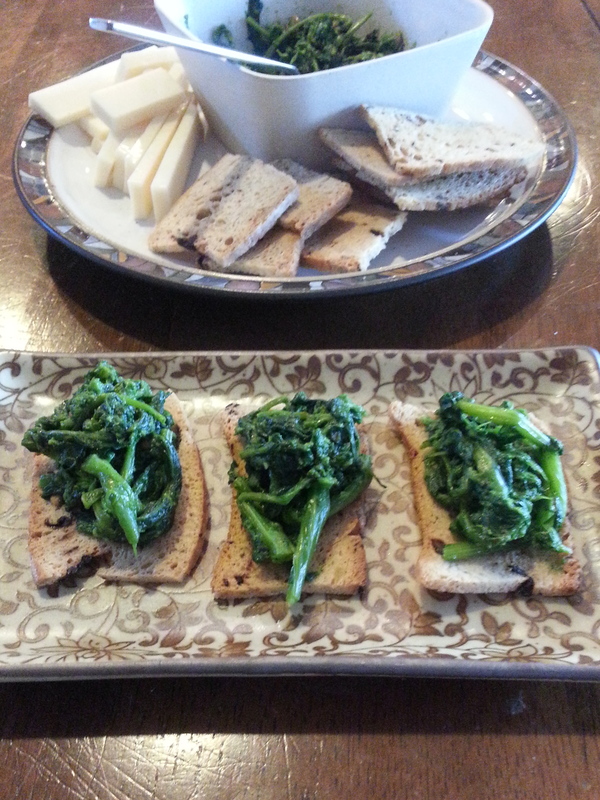 This entry was posted in appetizers, sides, veggie and tagged broccoli rabe, crostini, crushed red pepper, garlic, sautéed, sliced garlic. Bookmark the permalink. You’ve seen the canister. It can be done!